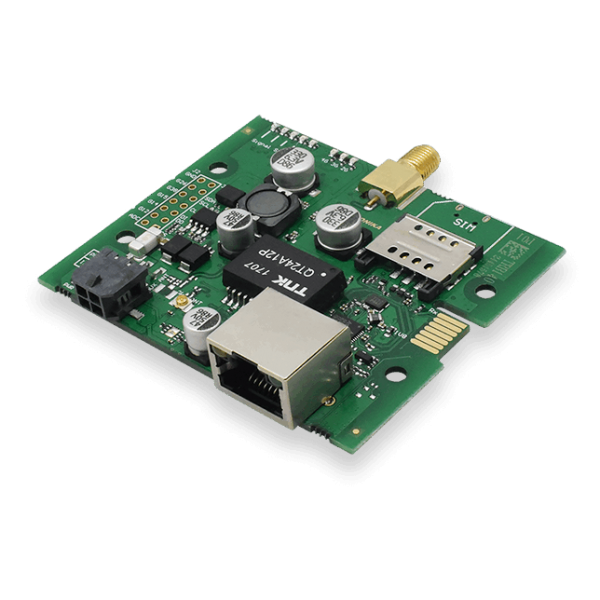 Produktinformationen "Teltonika TRB140 LTE CAT4 Gateway Board RJ45 - Board only -"
Industrial LTE Cat 4 Gateway Board TRB140 is equipped with a single Ethernet port, Digital Inputs/Outputs and micro-USB port. TRB140 compact design makes this Gateway perfect for an application where a sole gadget must be granted reliable Internet connectivity. TRB140 is engineered to be used in an Industrial application therefore it has a wide range of software features such as SMS control, Firewall, Open VPN, IPsec, RMS and FOTA support. Weiterführende Links zu "Teltonika TRB140 LTE CAT4 Gateway Board RJ45 - Board only -"
Patchkabel RJ45, VC LED, CAT6A 500Mhz, 7.5m, grau, LED in den Steckern! Poynting GSM-Antenne KFZ 1,8~4,5dbi 4G/GPS/GLONASS/WIFI MIMO 30cm SMA-M Kabel "Schwarz"